Generator use linked to suspected carbon monoxide death in Knox, while CMP hopes to have all powered back up by Thursday. 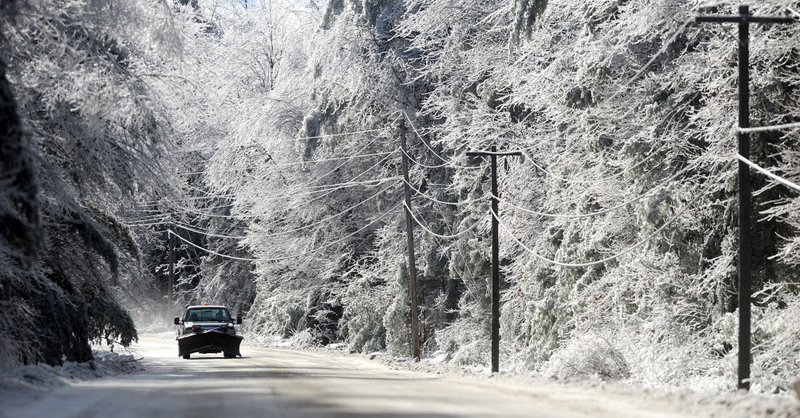 More than 100,000 people statewide, including 38,000 in Kennebec County, were without power on Christmas Eve and the state reported the first death due an ice storm that has paralyzed the middle of Maine. It will be be a blacked-out Christmas for many across the region — utility officials say it will likely be late Thursday before everyone is powered back up. Androscoggin: Lewiston High School:. American Red Cross emergency shelter, Lewiston, 1114 9th Avenue. Opening 5 p.m. Tuesday. Androscoggin: Oak Hill Middle School: Community shelter, Wales, 40 Ballpark Road. Opening 5 p.m. Tuesday, for pet-friendly, overnight stays. Bring bedding, cots and nonperishable food for your own consumption. Androscoggin: Wales Town Office/Fire Station: Warming center, Wales, 175 Centre Road. Residents needing a place to warm up may contact the town at 207-212-2879 and someone will meet them there to open the shelter. Hancock: Bar Habor Fire Station: Warming center, Bar Harbor, 37 Firefly Lane. Open indefinitely. Hancock: Blue Town Hill Office: Warming center, Blue Hill, 18 Union Street. Hancock: Brooklin Fire Department: Warming center, Brooklin, 25 Bay Road. Hancock: Brooksville Fire Department: Warming center, Brooksville, 2199 Coastal Road. Hancock: Miles Lane School: Warming Shelter, Bucksport, 100 Miles Lane. Hancock: Ellsworth Midle School: Emergency Shelter, Ellsworth, 20 Forrest Avenue. Kennebec: Augusta Civic Center: American Red Cross emergency shelter, Augusta, 76 Community Dr. Opening 5 p.m.; open until power back on. Shelter providing meals, blankets, and cots, while people must provide own pillows, sheets, medications. Pet-friendly, with owners are responsible for pets feeding and walking. Bring cages if available. Kennebec: Helen Thompson Elementary School: Warming center, West Gardiner, 309 Spears Corner Road. Open today from 9:00 a.m. to 2:00 p.m.
Kennebec: Winthrop Ambulance Base: Warming center, Winthrop, 31 Old Western Ave. (Old Winthrop Health Center). Open today from 10:00 a.m. to 8:00 p.m.
Kennebec: Faith Christian Church: Warming center, Gardiner, 280 Brunswick Ave. Kitchen, shower and bathrooms are available. Opening today at 3 p.m.
Knox: Hope Fire Station: Warming Center, Hope, 475 Camden Road. Lincoln: Alna Fire Department: Warming shelter, Alna, Route 218. Mainly warming shelter, but will accept overnights. Bring cot, bedding, medications, personal items, and food for your own consumption. It will remain open throughout the duration of the power outages for Alna. Lincoln: Dresden Fire Department: Warming center, Dresden, 100 Patterson Road. Will remain open throughout the duration of the power outages for Dresden. Lincoln: Faith Baptist Church: Warming center, Newcastle, Mills Road. Will remain open as long as there is a need. Lincoln: Wiscasset Fire Department: Warming Center, Wiscasset, Route 1. Will remain open throughout the duration of the power outages for Wiscasset. Penobscot: Newburgh Community Shelter: 2220 Western Avenue. Emergency shelter, pet shelter (bring food, cages if available). Cots and food available, bring own blankets, personal items, medications. Will stay open as long as needed. Waldo: Isleboro Community Center: Warming center, Isleboro, 103 Pendleton Point Road. The Maine Emergency Management Agency (MEMA) safety factors for running generators. Do not use outdoor cooking devices indoors such as gas or charcoal grills or gas camp stoves. Staff photo by Andy Molloy CONNECTIONS: FairPoint Communications splicer Jason Fredette hooks up a line on a pole in Richmond on Tuesday. 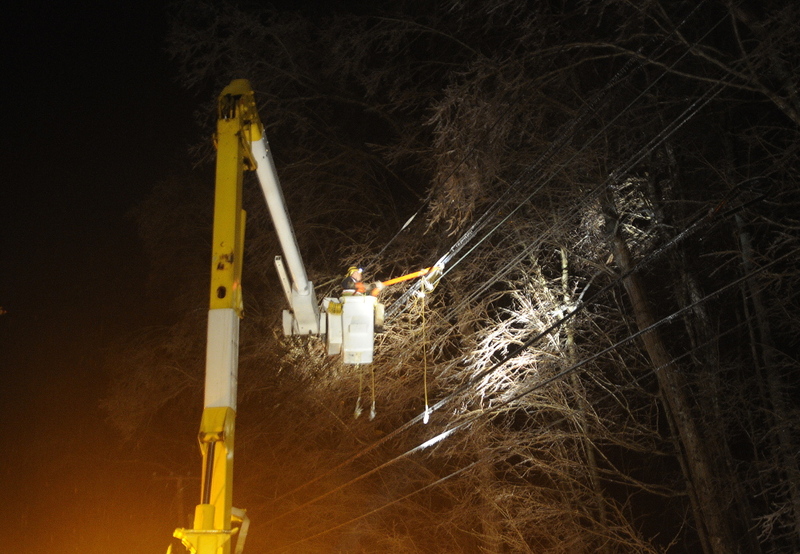 Utility crews from across New England descended upon Kennebec County to repair utility lines snapped by frozen limbs. Staff photo by Andy Molloy SHELTER: Nunzio Biondello sips coffee Tuesday at the Carrie Ricker School in Litchfield, which opened as a shelter for residents of the down. The 89-year-old had been without either power or heat for a day. 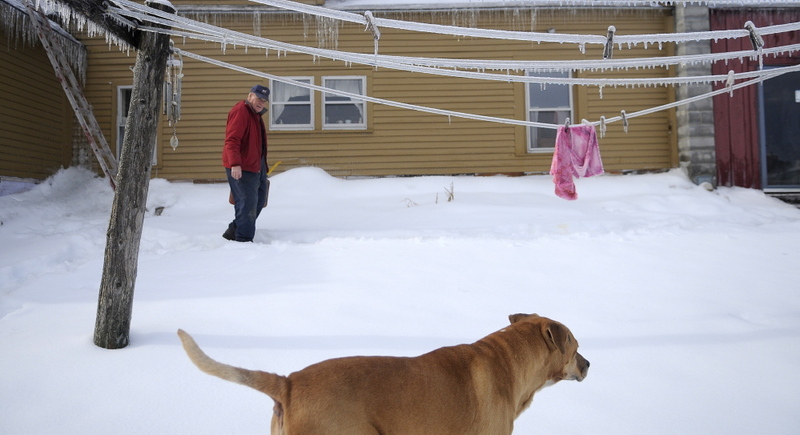 Staff photo by Andy Molloy SHELTER: Sonny Black walks past the frozen clothes line at his Litchfield farm after firing up the generator. Black had purchased a generator a few years ago to permit him to remain at the farm and tend to the herd of beef and dairy cows. Temperatures were in the 20s Tuesday and were expected to drop to single digits on Christmas Day. Early Tuesday afternoon, Sonny Black, a farmer who lives on Hallowell Road in Litchfield, where 98 percent of Central Maine Power customers were out of power on Tuesday, had just gotten his generator going. Christmas meal plans, however, were still up in the air, with family still set to come to his house on Wednesday. At the peak of the day, Kennebec County saw more than 39,000 outages, making up more than half of all CMP customers in the area. Shortly after 7 p.m. Tuesday, CMP reported that 64,000 customers were still without power, and Kennebec County remained the hardest hit, with 27,870 outages remaining. Thousands were also out in Waldo, Washington, Hancock, Androscoggin, Knox, Sagadahoc and Lincoln counties, and the opening of 19 warming shelters across the area were announced by Tuesday afternoon. Nearly 20 people had arrived at a Red Cross emergency shelter at the Augusta Civic Center by 6:30 p.m. Many caught a ride from the Augusta warming center or the Bread of Life homeless shelter, which was without power; others arrived on their own. Shelter manager John Osbun said they had more than 30 cots set up and another room that could be used as backup space if needed. Civic Center staff were providing hot meals, which included chicken parmesan on Tuesday night. Osbun said he would talk with CMP on a conference call later in the night about when they would be able to restore power in the area. “We’ll stay open until everybody gets their power back on, as long as it takes,” Osbun said. Aleticia Knox, 71, said she and her boyfriend lost power at their Sewall Street home at 7 p.m. Monday and had spent Tuesday at the Augusta warming center on Front Street. “We’ve got to be in a warm place. It’s too cold,” Knox said. She said their Christmas plans include the annual Christmas dinner at Prince of Peace Lutheran Church on Eastern Avenue. State police reported a case of carbon monoxide poisoning in Waldo County this afternoon, the first death apparently related to the ice storm. When Woods didn’t return from the garage, other family members grew concerned, and found his body in the garage about 15 minutes later. The family called authorities about 5:30 a.m., McCausland said. No county was hit harder than Waldo, where nearly 80 percent of Central Maine Power’s nearly 24,000 customers were without power Tuesday afternoon. In Kennebec County, Readfield, Pittston and Mt. Vernon were totally blacked out, and wide majorities were out in 20 of 29 cities and towns in the county, including Gardiner, Hallowell and China. More than 3,000 lost power in Augusta, where the city announced that the Augusta Civic Center would be opened as the area’s regional emergency shelter, where people will be able to stay for one or two days. The city will be busing people from the Bread of Life homeless shelter and city warming center at 4 p.m.
Gardiner Police Chief James Toman said the Faith Christian Church at 280 Brunswick Ave. will be open as the city’s warming center, open from 3 p.m. through the Christmas Eve service at 9:30 p.m., then open from 7 a.m. to 7 p.m. on Wednesday and Thursday. After that, Toman recommends that residents go to the Augusta shelter. “We’re prepared to keep it open until the power is back on,” said Roger Audette, Augusta’s fire chief. Gail Rice, a spokeswoman for Central Maine Power Co., said the company’s goal today is to restore power to the primary lines and to complete the damage assessment to secondary lines. Although the number of outages continues to be above 80,000, they hope to make significant progress today. “We’re hoping to knock that number down by quite a bit,” she said. John Carroll, another CMP spokesman, said the company had established a goal of restoring all power by Thursday evening, but he cautioned that obstacles could still slow the process. “It’s a goal, not a promise,” he said. Fifty to 75 additional line workers and 100 tree workers have been called in to the hardest hit areas of Kennebec and Waldo counties, she said. Crews from New York and New Hampshire are also coming in to assist. While efforts will be made today to restore power to main lines, Rice acknowledged that not everyone will have power by Christmas. 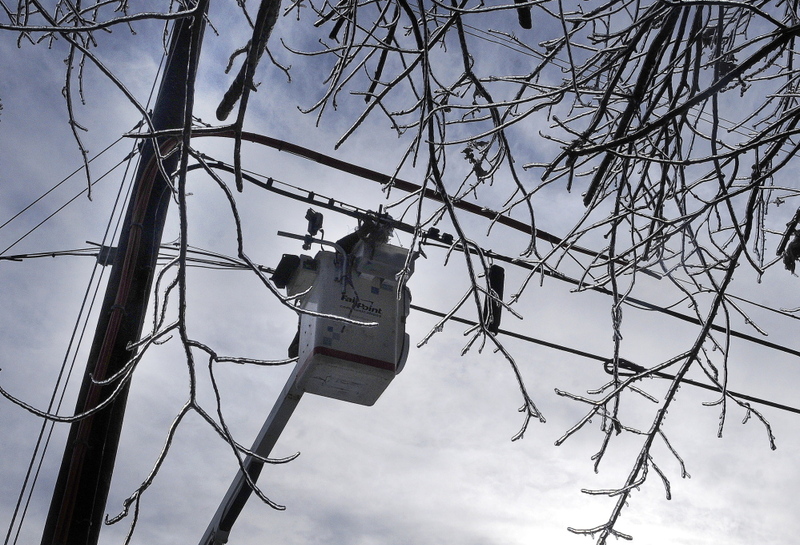 The ice storm that started with freezing rain over the weekend and continued throughout the day Monday lingered in the area longer than anticipated, adding weight to already heavy power lines and making conditions for travel difficult leading up to Christmas. While the rain that fell Monday stopped and the sun came out over central Maine on Tuesday afternoon, the National Weather Service issued a warning Tuesday afternoon that high winds could cause additional power outages. Plus, ice may not melt soon, with temperatures expected to drop to near or below zero overnight. Highs on Christmas Day will be in the teens and late Thursday, several inches of snow could hit the Augusta and Midcoast regions. The damage was especially devastating in rural, heavily wooded areas. In Litchfield, Fire Chief Stanley Labbe said overnight Monday into Tuesday, his crews responded to 100 reports of downed trees in roads. On Huntington Hill Road, he said crews were driving “almost steady” and finding downed trees. “There can’t be no trees left there,” he said. “There are, trust me,” chimed in Trudy Lamoreau, the acting town manager. However, he said the damage fell short of the 1998 ice storm that caused millions of dollars of damage and six deaths in Maine. Nunzio Biondello, a Brooklyn native who has lived in Maine 34 years, remembers that well, having lived in East Madison then. Then, however, a friend with a motor home was staying at his house, making weathering the storm easier. 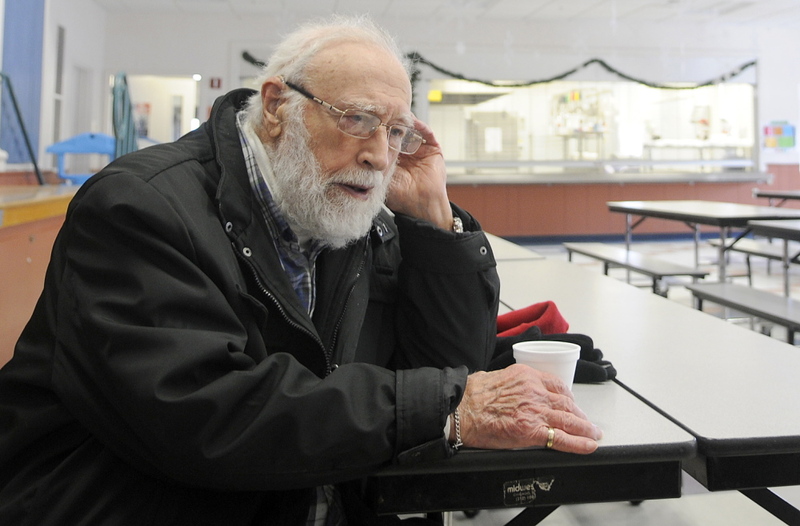 But his home on Pine Tree Road, the power was out, and the 89-year-old World War II veteran was one of the first arrivals at Litchfield’s warming center at Carrie Ricker Middle School on Tuesday morning. He said “the lack of my usual comfort” and “needing a nice, hot cup of coffee” brought him. In China, where Central Maine Power reported that nearly all of its 2,555 customers were without power late Tuesday morning, resident Deby Foote, who lost power Monday afternoon, was still without power late Tuesday morning. She said that, with a generator in place, the family was continuing with its holiday plans to host dinners on both Christmas Eve and Christmas Day. “Christmas is going to continue on,” she said. “This is a rough time of year for people to be going through this,” Lynette Miller, spokeswoman for the Maine Emergency Management Agency, said. “We’re obviously concerned about the number of power outages that spiked yesterday,” she said. Larry Jensen, the pastor at St. Joseph Maronite Church in Waterville, said he knew of several parishioners who had left their homes to check on neighbors or other church members they thought might need help. He said no one was found in distress during the checks. In China, where Central Maine Power reported that nearly all of its 2,555 customers were without power late Tuesday morning, Town Manager Daniel L’Heureux said the town was prepared to provide warm shelter for those who might be frozen out of their home with nowhere to go. “We will keep them warm,” he said. Those who call the town office will be referred to the China Baptist Church, which is being heated with a generator, but L’Heureux said that, as of late Tuesday morning, no one had yet called the town. “People are being very creative and self-reliant at this point,” he said. Town crews were also responding to reports of downed trees and branches blocking the town’s right-of-way. The Red Cross was working to prepare for those who might have been made temporarily homeless by the ice storm. “They have agreements with a number of facilities around the state to be regional shelters,” Miller said. Regional shelters had been established in Brewer, Belfast and Calais, while other shelters were set up in Winthrop and West Gardiner. Miller said another regional shelter might be opened in Wayne, but that it had not yet been confirmed. Aaron White, an EMT with the Winthrop Ambulance Service, said only four people had made use of the a shelter set up at the ambulance base as of early Tuesday afternoon. All four of the people, who he described as elderly and from different households, had found other accommodations within hours, he said. County directors work with towns and agencies to make the decision about whether to open a shelter. Miller said the judgment calls were made based on predictions of when power would be restored, and how many requests were heard from the public. Miller also reminded people to use caution when firing up generators, to watch out for traffic lights that may not be working properly, and to be mindful of food that may have spoiled during the outage. In Oakland, where about 1,000 of 3,500 were reportedly without power, Selectman Byron Wrigley said he had heard reports of scattered outages that were mostly for short periods of time. Mike Perkins, also a selectman, said he lost his power at his home on Willey Point Road Monday night about 8 p.m., and was still without power at noon on Tuesday. 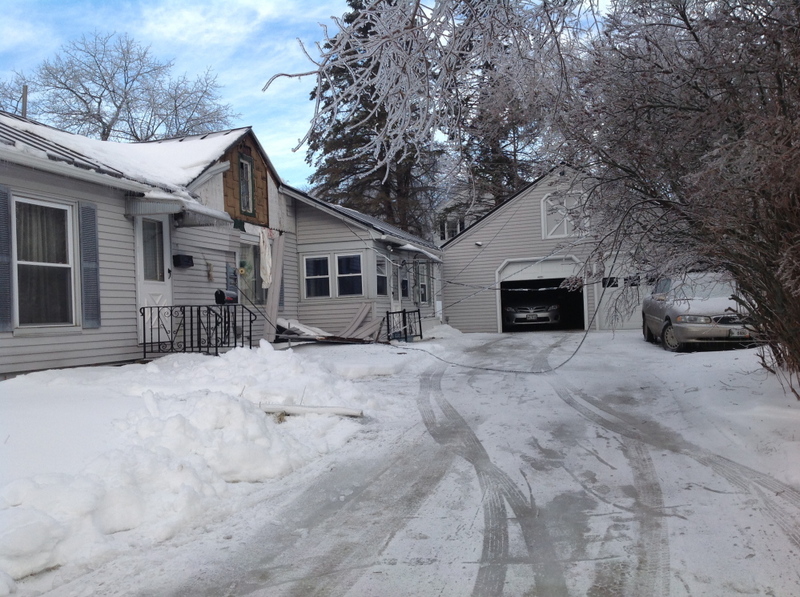 Perkins, like many others in the area, was using a generator to supply power to the home. Kennebec Journal City Editor Susan M. Cover and staff writers Matt Hongoltz-Hetling, Keith Edwards and Susan McMillan contributed to this report.